Deb in Liberia: good news. bad news. I'm going to start with the bad news-- the situation in Liberia is spinning out of control. Not only are the number of Ebola cases skyrocketing, but unrest is bubbling under the surface. Violent mobs are gathering, curfews have been mandated, the economy is crumbling, people are going hungry. Countless others are dying of other common ailments for the region, like Malaria and Typhoid, because they can't get any medical help. I read one statistic that said that since Ebola has struck West Africa (killing over 1300 people so far), over 300,000 people have died of Malaria. The situation in Liberia was fragile before Ebola struck. The county has been working hard to rebuild after a long civil war ended a decade ago. The stress of this situation is exposing the fragile infrastructure. 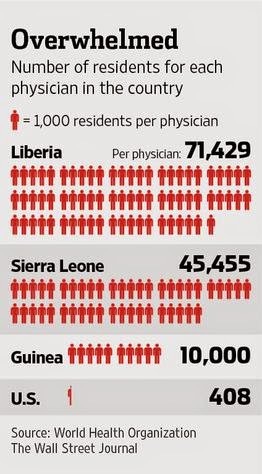 There are not enough doctors or medical resources in Liberia. The citizens do not trust their government. Then add to the equation-- no basic knowledge of what a germ is or how it is spread, a common belief that Ebola doesn't even exist, a culture that is based off of relationships, touching, and living in close proximity with others, and traditional burial practices that include family taking care of a loved one after they die, and you get the perfect storm that is tearing apart Liberia at this moment. Liberia needs help from the international community or it may not survive this emergency. God Help Liberia! This article helps to explain further why Liberia Cannot Cope with Ebola. This graphic helps to explain part of the problem in Liberia. 1 doctor for every ~70,000 people! 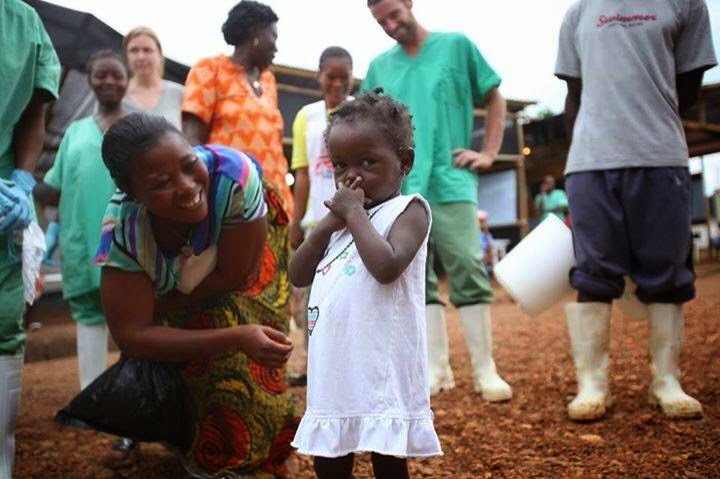 This 22 month old girl is the youngest to survive this outbreak of Ebola. She walked out of an Ebola treatment unit in Liberia yesterday with a clean bill of health! And more joyous news was announced today-- Dr Kent Brantly and Nancy Writebol, both American's who were fighting on the front lines of this battle in an Ebola treatment clinic in Liberia and contracted the virus, were released from the Atlanta hospital where they have been treated in isolation for the last three weeks. They are both 100% Ebola free!! Dr Brantly made some public comments upon his release. Here is a link to the video of what he and his doctor had to say upon being discharged from the hospital today. It was reported that when he was discharged this morning he ran out of his isolation unit giving high fives to all the staff who cared for him and praising God for his miraculous recovery. I have never met Dr Brantly or Nancy, but I feel like I know them. Many of their friends and co-workers at Samaritan's Purse and SIM are mutual friends of mine. Many are still working for these two organizations who continue to sacrifice to serve the people in Liberia during this crisis. The people who work for these two organizations were leading the fight against Ebola in Liberia long before the rest of the world even knew it had hit. For more information about Samaritan's Purse and SIM, or to donate, follow these links.